It's been wonderful watching Owen Davey's career progress, and his latest offering is further confirmation he's heading in a phenomenal direction. 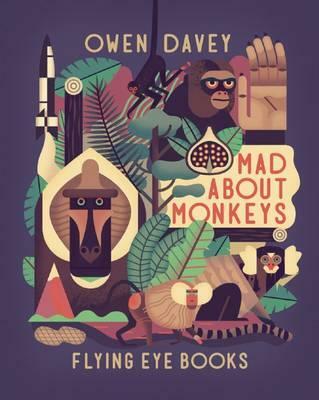 With a cloth-bound, embossed and foil-titled cover, Mad About Monkeys is one of a new breed of sophisticated 'information' book that's been peppering our market of late. Exquisitely illustrated (we simply must talk about the illos first) with moody colours, divine visual texture and plenty of quirk, the layout of each page is superb--perfectly balancing information with image in a way that's not only pleasing to the eye, but easy to navigate. The book covers all manner of monkey--firstly discussing what actually typifies the monkey, followed by how they live, what they eat, their family tree and--something I didn't know--how monkeys are divided into two main groups--Old and New. Old monkeys are found in the Americas. New monkeys are found in Africa and South East Asia. Each type has distinct physical differences--such enchanting information for an adult; I can only imagine how a child would respond to this. We learn about large and small monkeys, their social life, the weird and wonderful types (amazing--my favourite section! ), how clever they can be, monkey mythology, their habitat (and current destruction) and much, much more. All presented across the most beautifully-crafted and designed pages ... it makes you wonder why all information books can't be like this. If you're keen for a bit of monkeying around (what kid isn't?? ), Mad About Monkeys is a priceless way to get your primate fix. Glorious stuff.